Head of the F-35 program Lt Gen Chris Bogdan has played down concerns over the engine problem that has grounded the F-35 fleet, instead seeking to highlight what he sees as the program’s achievements. The Joint Program Office chief was keen to move on from negative press coverage of the F-35 and what he described as the program’s “turbulent history”, stating that since 2011 all major milestones have been met on schedule. “What you see today is you see a program that has a different way of operating and you see a program that is now starting to meet the promises that everyone expects us to meet,” Lt Gen Bogdan said during a media briefing on the sidelines of the 2013 Chief of Air Force Symposium in Melbourne. With regard to the discovery of the engine blade crack, he said that such incidents were to be expected in the course of developing a military aircraft, adding that such a grounding may well happen again in the future. He said the cause of the crack is as yet unknown, and could be anything from foreign object damage to a manufacturing defect or a design fault, but stated that he believes an explanation would be found by the end of the week. 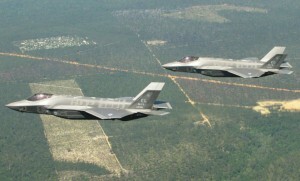 Lt Gen Bogdan also said that he had been in contact with all of the F-35 program partner nations to explain the situation and that they understood the nature of the grounding. Isn’t it refreshing to have someone at the head of this project who is up front and tells it like it is! He impressed me on the 4 Corners report with how open and direct his answers were. Clearly a man who calls a spade a spade. Chris – yes, I agree. I watched right through the 4 Corners report and was also impressed with how candid Lt Gen Bogdan was. I have confidence that the F-35 will be a winner in the end. There will always be developmental issues to iron out with complex programs such as this.